Here's a little preview of Nubar's upcoming Chocolate Truffles collection! This is due to be released soon... I seem to have misplaced my press release so I don't know the date. Sorry, guys! There hasn't been any sunlight here, so I had to take these inside... I apologize in advance if they're a little blurry or glare-y. From the top! Cherry Cordial. A warm red/brown/gold/pink subtle duochrome shimmer. You can see some of the greenish-gold duochrome up near my cuticle. It's not one of Nubar's signature Super Duochromes, more of a subtle effect, a reflection. Chocolate Caramel. Warm milk chocolate brown base with strong green-gold shimmer. I think this is my favorite of the collection! Well.. no... I'm having a hard time picking *one* favorite, but this is definitely top three. The shimmer is crazy! It's so bold. Electric chocolate. It's so fall! Chocolate Coffee Bean. Dark chocolate brown with duochrome red/pink/golden shimmer. another very subtle duochrome. The shimmer shifts colors with the angle of your hand. The shimmer in this is also on the large side- almost like glass fleck but colored. Milk Chocolate Creme. Warm milk chocolate brown creme. Haha, this really does look like milk chocolate! Or melted milk chocolate. I don't think it works as well on my skintone as I hoped, but I'm still going to wear it... Cause... It looks like chocolate!! Raspberry Truffle. Dark chocolate brown with cool-toned red shimmer. This is another one that's tied for my favorite... It's the darkest color in the collection, vampy even. The shimmer in it is what makes it special- it looks like little glowing embers. The base is so dark and the shimmer is so large and bright, it just looks mesmerizing. Maybe you should view this one full size to get the full effect. Swiss Chocolate. Soft deep brown creme with purple tones. Maybe this one is my favorite... I don't know... I can't decide. Either way, this one is beautiful. It's not just straight brown, it seems to have a plum or purple tone to it. It's a little cooler than the other shades in the collection so it works on my skintone better. This one also strikes me as looking 'elegant'. It's an elegant brown. The formula was great. I didn't have any problems at all. The cremes didn't apply the same as the shimmers, but they weren't troublesome. These are very opaque- two-coaters.. I did three coats just because I wanted to see what they looked like with three.. and they looked just like they did at two coats. Drying time is average, not as fast as say, OPI, but not long either. An interesting note- these all dry shiny without topcoat. I'm not wearing any base or topcoat in these pictures. So many browns -- and they're all different! I really thought I'd pass on a couple of them because they'd be similar. But I must have them all. I love these "suites" of one color that Nubar is doing -- Goin' Green, Cleopatra Purple, now the brown. I hope they do a yellow collection! 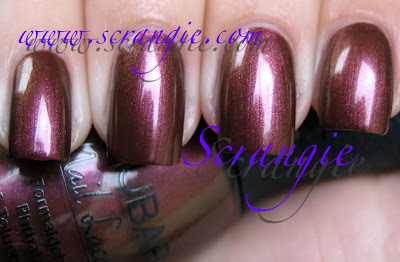 Scrangie, thank you SO much for posting these swatches super-fast. You are the best! Wow they all look so good! The names sound delicious too! I cannot make up my mind which one I like best. May have to buy them all! I was waiting for your review of the chocolates collection! I love brown polish and I'm really excited about these! All I can say is holy Christ, I cannot wait to get these!!!!!!!!!!! Raspberry Truffle wins as my favorite (at the moment at least) but I really like this whole collection - better than I would expect of an all-brown offering. I think I might need some of these. You're a terrible influence lol!! I want Chocolate Caramel and Raspberry Truffle. SO PRETTY! goddddd, that Raspberry Truffle is TO DIE FOR! I love it! Ooohh, I'm loving these for fall! I need Chocolate Coffee Bean, Swiss Chocolate, & Raspberry Truffle. These may be my intro to Nubar! Where do you all buy them from? Their website? Can we buy them individually, or do we have by the set? As someone who has struggled with giving up nail-biting, I don't think I want to polish my nails with anything that reminds me of chocolate. I usually don't like brown shades of polish but these are all so pretty they make me reconsider. OMG. Raspberry Truffle and Chocolate Coffee Bean are soooo gorgeous! I'm coming out of lurking to say that you are a very bad influence on me! I've already spent close to $50 on nail polishes and supplies alone. I've been looking for the perfect chocolate colors ever since I lost my discontinued Mac nail varnishes from 4 years ago! Oh how I loved that beautiful shiny dark chocolate nail color! I got so many compliments too! Whenever I took it to the nail salon they always wanted to keep it or buy it from me! 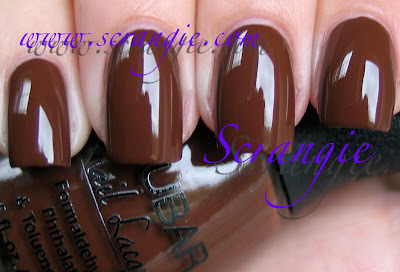 The Nubar Swiss chocolate is an exact replica of the Mac nail varnish! GerryBerry, I'm NW 50 and I got so many compliments when I wore the dark chocolate Mac varnish! Dark varnish against well manicured Dark Chocolate skin is very chic! Don't be afraid to take that risk! One of these days I'm going to break down and make a Nubar order. Chocolate Coffee Bean will definitely be on the list. I'm definitely getting the whole collection. Raspberry Truffle is my favorite. The milk chocolate makes me want some candy so bad! I could use some Hershey Kisses. Oh wow, those are beautiful! I only have a few browns and these are tempting me!!!! Nubar does such nice colors. I agree, you're making me poor. Raspberry Truffle must become mine. I'm not very impressed by browns. These all look nice, but other than Raspberry, nothing I'd buy. I didn't think I'd like this collection since browns aren't my thing, but these are gorgeous! My poor wallet! I wish they sold them individually. Raspberry Truffle and Coffee Bean are my favorites! And they make me hungry lol. Your posts are killing me and draining my bank account. Gonna be hard to deny a girl her chocolate brown lusciousness. where can i get nubar polishes?!?!? i love this collection! I'm trying to determine if I'd actually wear Raspberry Truffle. I think it's gorgeous in your swatches. Great pics as usual! My faves are Cherry Cordial, Raspberry Truffle and Swiss Chocolate (in that order). I want these sooooo badly!!! Do you know when they'll be available?!?! just ordered the whole collection. God they're all gorgeous . . . I couldn't help but set up a hyper link on my tumblr to your blog. It's at datura-toxitown.tumblr.com. If you want me to take it off, please let me know. LOVE them all!!! The gloss finish is a plus in my book. I don't care for matte finishes. i loveeee your blog and look forward so much to your posts each day. honestly, keep doing what you're doing. you've motivated me to grow my nails again and get them polished all pretty!!!! Wow! This collection is gorgeous! I'm loving Raspberry Truffle and Chocolate Caramel! can you post and let us know what your nails are? like do you have acrylic or something? it doesn't look like tips but just wondering because i want themmmm! OH! I would love to see the frosts and glitters in this set overlaid with a matte topcoat. Some frosts turn to Satin, and I bet some of these would be gorgeous. I can see a few I'll have to look for. Does Nubar ever do "minis" of their collections? Swiss chocolate reminds me of OPI's "You don't know Jaques". Does it in real life?